This is one of my favorite 21 Day Fix crock pot and Instant Pot recipes! When you’re following the 21 Day Fix pork carnitas are perfect because you can easily add veggies to them to get in all of your green containers for the day. We all love an easy recipe for dinner, right?! These pork carnitas are not only delicious, they’re also easy. 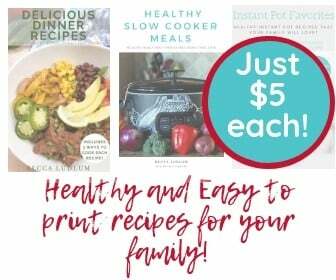 Thanks to the Crockpot or the Instant Pot you can have a healthy meal on the table for your family in no time. 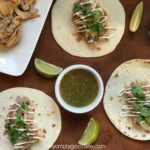 I love these 21 Day Fix pork carnitas because they’re so versatile. You can top them with all sorts of veggies, eat the mat on its own, add some to a salad, etc. My family can build theirs exactly the way they like and I can enjoy them as part of my 21 Day Fix program, easy as that! Green Chile Salsa–the less ingredients, the better! How do I make these delicious pork carnitas in the Crockpot? Pull pork out and shred it, then add it back into the crockpot. Serve with the rest of the bottle of green chile salsa, warm flour or corn tortillas, diced onions, and sour cream. 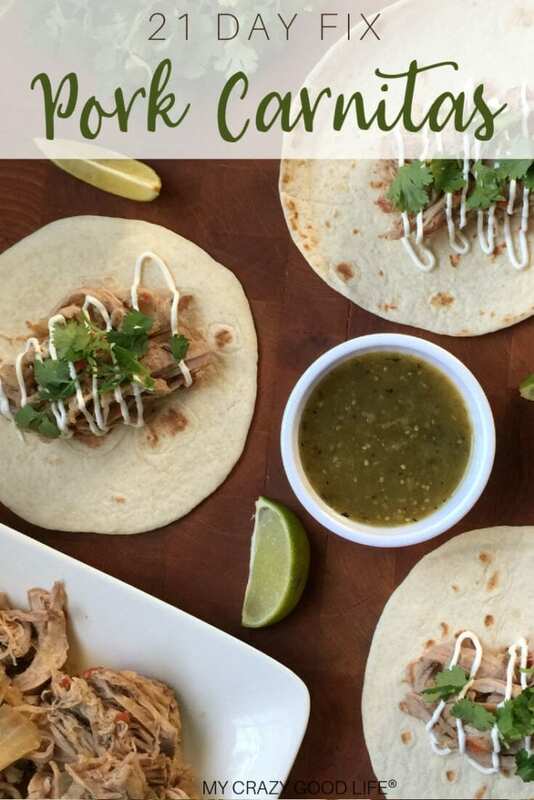 Want to make this pork carnitas recipe in the Instant Pot? Add pork tenderloin and other ingredients into the Instant Pot. Pressure cook on high pressure for 8 minutes (I did this for a 2 pound tenderloin), then let pressure naturally release for 15 minutes. How do I count these 21 Day Fix Pork Carnitas? I count them as follows: 1.5C of Pork Carnitas = 2 Red. Add veggies to your carnitas if you’d like–I love adding peppers and more onion! Garnish with plain greek yogurt. 2 small corn tortillas count as 1 yellow container. You can add these kinds of things to your counts based on how much / what you decide to eat with your pork carnitas! Is there a way to avoid using a yellow container for these? If you’d rather not eat these in corn tortillas, I’d suggest using bell peppers as a delicious bowl! I know sometimes it’s hard to give up a yellow container for tortillas but honestly, this pork carnitas recipe goes well over veggies, in a bell pepper shell, or even alone! Do you have any other recipes like these pork carnitas? Yes! Of course. Here are some other tasty (and easy to make) dinner recipes that the whole family will enjoy. Can I have these pork carnitas on Weight Watchers? Sure! You can have just about anything on Weigh Watchers as long as you track it. Luck for all of us, this pork carnitas recipe is a healthy one, it is low in points! 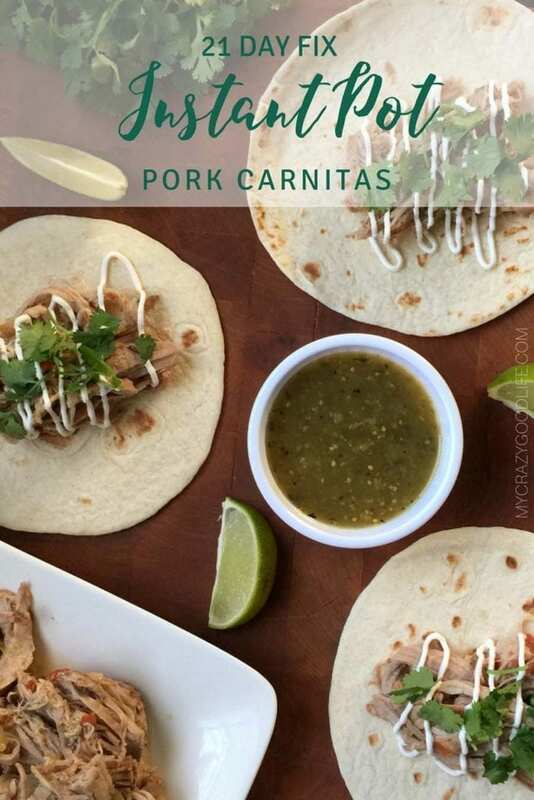 You can see the full Weight Watchers Pork Carnitas post for tips, detailed info, and more. Each serving (assuming 8 servings per batch) is 3 Freestyle Smart Points. You can add a reduced fat sour cream for 2 Points for 2 Tbsp! This is one of my favorite 21 Day Fix crock pot and Instant Pot recipes! When you're following the 21 Day Fix pork carnitas are perfect because you can easily add veggies to them to get in all of your green containers for the day. 16 ounces Green Chile Salsa the less ingredients the better! Cook on low for 5-8 hours, depending on the size of your tenderloin.Pull pork out and shred it, then add it back into the crockpot.Serve with the rest of the bottle of green chile salsa, warm flour or corn tortillas, diced onions, and sour cream. 21 Day Fix Notes: 1.5C of pork is 2R and 1/2G. 2 small corn tortillas count as 1 yellow container. How big of a pork tenderloin did you use for this? Whatdoes “T” stand for? TBSP or TSP? It totally depends on how big your pork tenderloin is. 2 pounds gets you about 8 servings. Made this with chicken and added some cumin. My family loved it! Just wondering why 1.5C of pork = 2 Reds? Wait! Just losing my mind… I was thinking 0.5 in my head, even as I wrote 1.5. All clear now… thanks anyway! Can you use a frozenloin or thawed? Does the cooking liquid count as a green? How do I count Rotel when cooking with it? What is the white sauce you drizzled over the tacos? Second time making this recipe.. Absolutely amazing! Thank you so much! **Using my fitness pal app: how much is one serving? I was curious about the cooking time, I had copied and pasted your recipe and the cooking time said high pressure 15 minutes. Today I came back to the site to see the size of the tomato can and the cooking time now says 8. Which is correct for a 2 pound tenderloin?